The Model T Ford was available from the factory as a complete running chassis. This spawned a whole range of professional and home made timber bodies. This gallery page is dedicated to the "Woody".. 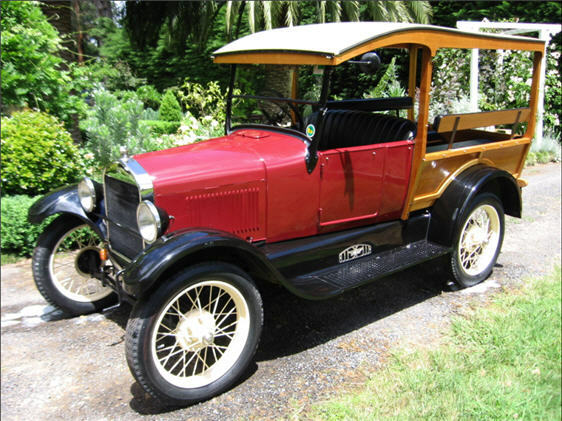 Whether it be professionally built Woody, such as Martin Parry truck bodies or a home made body in the Depot Hack style, the Woody as it is affectionatley known gave many a T owner endless ways to modify the Model T to their needs. Many Model T's were salvaged second hand or modified from other body styles to suit the owner. This is the case with my car, featured on the home page and also here, it was once a tourer that has had the rear section rebuilt as a 'Shooting Brake'. Be it known as a Shooting Brake (English name) the Depot Hack (American) or the more modern Station Wagon, the Woody's were often fitted with perimeter seating and in the case of my car, enables 4 passengers in the rear, or, a great payload area for all the camping stuff!